Combining a lightweight construction with oil repellence and abrasion resistance, the 18-gauge Ansell HyFlex 11-937 Oil-Repellent Lightweight Gloves are ideal for providing hand protection in a wide range of industries. They also feature a knitwrist cuff for improved wearability, a three-quarter dipped palm, and Dyneema Diamond Technology lining for good cut resistance without compromise to dexterity or flexibility. The product code for the pair of gloves is: 11-937. Protecting the hands is essential for safer working, and this is particularly true when working in oily environments. 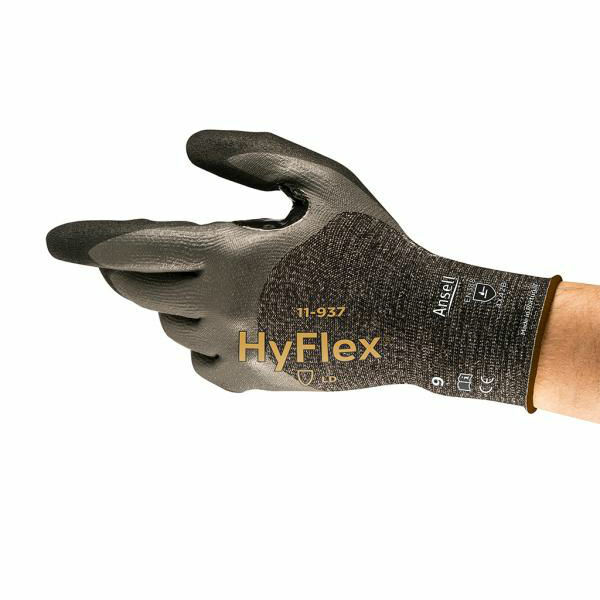 The HyFlex 11-937 gloves have been designed with RIPEL technology to reduce the risk of oils coming into contact with the skin. Additionally, the inclusion of the Dyneema Diamond Technology liner provides the gloves with improved grip when handling oily or wet materials, improving both safety and working conditions. The table below showcases the test results of the Ansell HyFlex 11-937 gloves according to EN 388 Mechanical Risk specifications. The Ansell HyFlex 11-937 Gloves are available in a choice of sizes, making them suitable for most users. Please consult the table below for details, then select the required size from the drop-down menu at the top of the page. The glove length will range from 212 - 261mm.